STEP 2: Choose a duration option. The further ahead you pay, the lower the effective cost per month. Your printable invoice or quote will be displayed. You can then print it, save it to your computer, or email it to your Accounts Payable department. 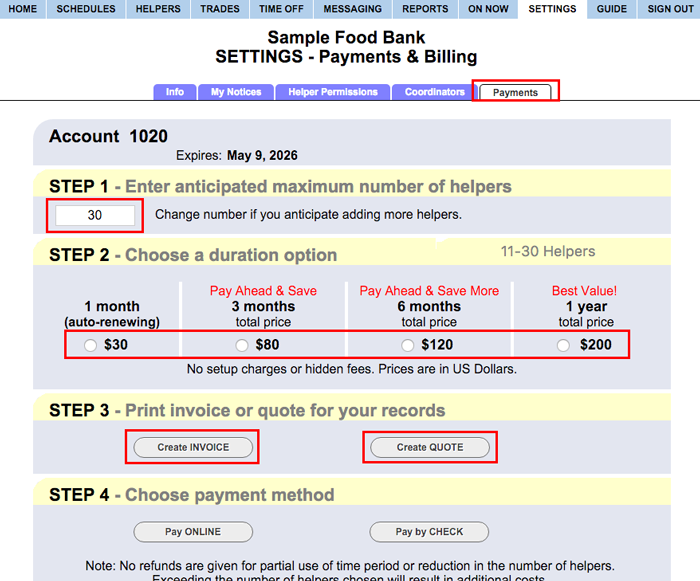 You also can send them a one page payment information PDF: http://WhenToHelp.com/paymentinfo.htm. Note: You can also set up your Accounts Payable department's email address in your SETTINGS>My Notifications tab so that they are notified 45, 30 and 10 days before the account will expire.